Like many thrillers, Greta has a benign start in someone showing kindness to another. Francis (Moretz) finds a purse left on the subway, with ID, cash, etc., inside. Her roommate Erica (Monroe) sees it as an opportunity for a spa day, but Francis is an honest, kindhearted soul who sees it as a duty (and a privilege) to return it personally to its owner. That is Greta Hideg (Huppert), a charming widow who is very grateful and offers Francis tea and company. They chat, and Francis learns that Greta has not only lost her husband and her dog, but her daughter is in France. Out of genuine empathy, Francis offers to help Greta find another dog. This is politely refused; however, soon after they part, Greta calls on the phone and takes Francis up on her offer. Francis does indeed help Greta, and as they spend some time together, they become friends. This is somewhat to the chagrin of Francis’ roommate, Erica, who finds that Francis’ time with Greta means less time with Erica. “Why do you want to spend so much time with an old lady?” she asks, and suggests that Greta stands in for Francis’ mother who passed away the year before. 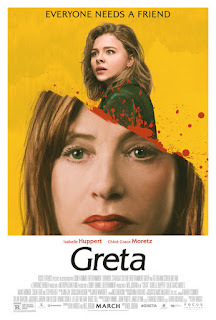 Francis is dismissive of this charge; however, when she is at Greta’s soon after, she finds something disturbing, and decides to end her friendship with Greta. Ah, things are never so simple in a thriller. As she tries to extricate herself, Francis confronts a needy, controlling stalker who is determined to hold onto her. Stalking is only the beginning of the horrors that are in store for Francis. This is the place where I had problems with the movie; at this point, it piles on so much, more and more, it loses its appeal, and becomes a laborious slog to get to the end. Before it does wrap up, there are entertaining scenes with Erica back in the picture to enliven it. This film pales against Huppert’s previous film, The Piano Teacher, partly because it does not delve into the perpetrator’s psychological past. We see that Greta is lonely and that she has a checkered past, but we’re not shown the antecedents to her obsessions. Isabelle Huppert is her inimitable witchy threat who sends chills up your spine with her craftiness and manipulative ways. Moretz has her character match Greta’s terror with her innocence, naïveté, and compassionate willingness to help others. This juxtaposition is one of the strongest assets of the film. Stephen Rea’s cameo offers additional thrills, and Maika Monroe’s savvy solution to the problem is clever. One of the biggest faults of the story, however, is her character’s suggestion to Francis to apologize to Greta and take responsibility for a “misunderstanding.” This is a weak plot turn that seems stupid on its face, in view of the severely disturbed character they are dealing with. Despite minor weaknesses, this is a tight thriller that will entertain you. The opening of this film set me up for disappointment with an extended battle in dim light in which the characters are not recognizable. Suddenly, there looms a glorious, colorful view of the island of Berk, and things began to look up. What follows, however, is the least interesting story of the three Dragon movies. Here, the challenge for Hiccup (Baruchel) and Toothless, his dragon, is to meet the threat posed by Grimmel the Grisly (Abraham), a dragon-hunting warlord who has a nefarious plan to capture Toothless and make him the leader (alpha) of all the dragons he has captured. He will send out his captive white Fury to beguile Toothless and bring him to Grimmel. In the meantime, since Berk is becoming overpopulated with dragons, Hiccup is trying to find the utopia for dragons that his father had told him about, the Hidden World. If he could move the population there, they could live happily ever after in safety from the dragon hunters. 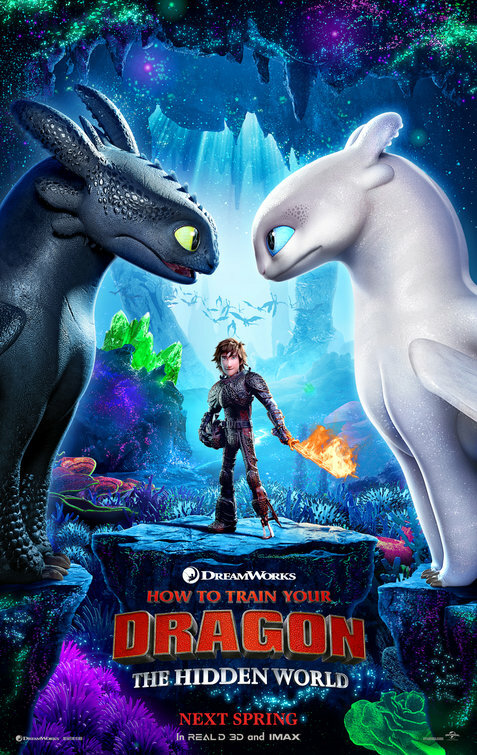 Unexpected events happen in both Hiccup’s and Grimmel’s plans, the most profound being that Toothless and the white Fury stumble upon each other and it is love at first sight. Writer/director Dean DeBlois has chosen different themes for this version of Dragons. It’s partly about how true love involves dealing with loss and letting go of a loved one at the proper time. Loyalty and heroism get woven in as guiding principles in love. Hiccup retains his original concerns for the social good and acts upon them. I did not find the story as compelling as in DeBlois’ previous two Dragon productions, but Gil Zimmerman’s cinematography and John Powell’s music are as impressive as they were in their earlier work. Dragon training and the search for utopia is interrupted by love. Iceland’s bitter cold and isolation are constant companions in this film about a man whose cargo plane has crashed in the Arctic, and who only has flares to signal passing aircraft that he is there. We don’t know how long he’s been there, but he’s clearly knowledgeable in rigging together ways to save his life, e.g., an SOS sign planted in the snow, a contraption designed to bring in fish from water below the snow for food, and a signal transmitter to connect with aircraft. We are told nothing about him; we glean whatever information we have from observing him for days carrying out the business of surviving in hopes of being rescued. This introduction gives the viewer a sense of this unusual story and how it will play out. It becomes an excruciating drama about the seduction of hopeful events, a hero’s dogged response and determination, and the seemingly endless frustrations a man encounters in trying to fulfill his moral imperatives. The inveterate Mads Mikkelsen (Jagten, At Eternity’s Gate, The Hunt, TV’s “Hannibal”) gives a tour de force performance in playing out the single-minded, grounded Overgard, who manages to meet every conundrum thrown to him by fate. The entire movie hinges on what happens in the end. Has he been successful? 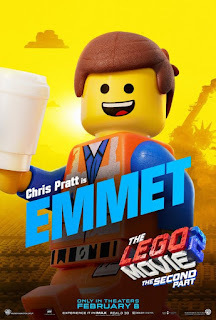 Will he get rescued? Will his charge whom he has taken upon himself to rescue be reunited with her family? Not every one of these questions will be answered. The writers (director Joe Penna and Ryan Morrison) have achieved excellence in giving skeletal details underlying a major heroic story while keeping the viewer on the edge of the seat. Tomas Orn Tomasson’s cinematography evokes awe and mystique in the polar landscape, while still capturing the intimacy of the inside-plane scenes of Overgard trying to feed the found woman and find out anything—anything!—from her. 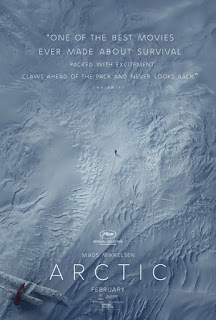 This is a film for the outdoors person who loves adventure and challenges involving a quiet hero following his conscience. Oh, what a tangled web of secrets in this extended (2¼ hour) mystery. Lots of characters within a family are thrown at us at once, making it difficult to keep track of who is who, although the main characters, Laura (Cruz) and Paco (Bardem) are obvious from the start. Alejandro (Darin), Laura’s husband, only enters during the last half of the story. We see Laura and her two children, Irene and Diego, being picked up by Laura’s sister Ana in Spain, a place where Laura grew up. They have come from Argentina for Ana’s wedding, a huge affair in a small village. As more and more relatives are introduced, it becomes confusing again as to who everyone is. But they’re all in a festive spirit, and Irene pairs up with a local, attractive Felipe. She is a daredevil driving his motorbike on country roads with him on the back trying to caution her. This will be a theme in their brief time together. The wedding takes place within a sea of fast-moving images, lots of drinking, dancing, and hilarity, and at one point, the lights go out in a thunderstorm. Even before the cake is served, Irene has become woozy and is taken up to bed. The next morning, she has vanished, with clippings from a newspaper left on the bed, telling the story of a kidnapping years earlier. Before long, Laura is getting messages from the perpetrators demanding a huge amount of ransom money. Of course, Laura is beside herself, and since her husband stayed home in Argentina, she turns to Paco, an old childhood friend, who now owns a winery. Curiously, his wife, Bea, begins receiving the same messages as Laura. What follows is the unearthing of family secrets and past family resentments as they try to figure out where Irene is and whether she is alive, since they’ve been forbidden to go to the police. Complicating the picture, Irene has asthma and is presumably without her medication. The Iranian filmmaker, Asghar Farhadi, is known for his detailed dramas in which he explores human traits in complex dilemmas. These often have ethical/moral binds the characters have to work through. 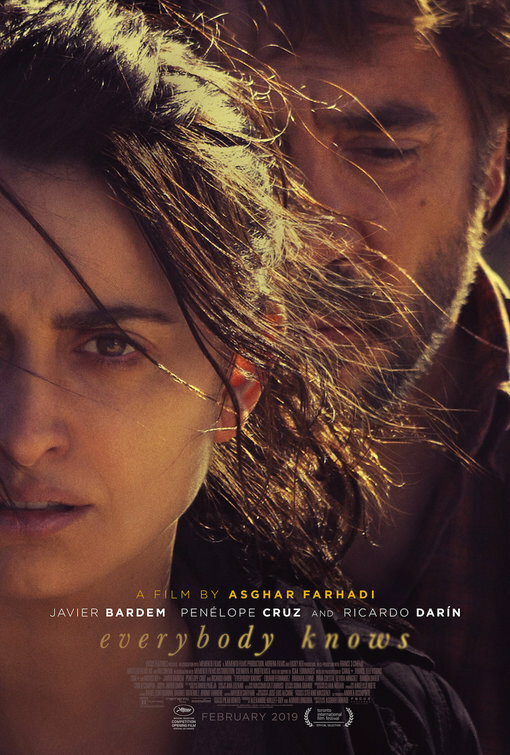 Everybody Knows seems not quite up to his previous work in About Elly, A Separation, The Salesman, and The Past, but he is remarkable in producing a Spanish language film with well-known Spanish actors—without knowing the language at the outset. The film opened the 2018 Cannes Film Festival and was nominated for the Palme d’Or. It resembles About Elly in its theme of kidnapping, but the gossip and secrets are within a family rather than among friends, and there are other differences. In this film, one is left with additional questions and musings that are not addressed in the end. Cruz and Bardem are revered actors who give exemplary performances, and this is no exception. Ricardo Darin is an award-winning actor from Argentina whose acting here is entirely convincing and appealing. Asghar Farhadi continues to intrigue/puzzle us with his human dramas. How long has it been since you saw a creative, really romantic rom-com with new ideas? I daresay not since the 1990’s and maybe early 2000 (e.g., When Harry Met Sally, You’ve Got Mail, Sleepless in Seattle, High Fidelity). Isn’t It Romantic is predictable based on all these earlier films and it, unfortunately, borrows from Melissa McCarthy’s playbook in having the heroine blunder, stumble, and tumble time and again. But hey!, these antics are always good for a laugh in the audience somewhere. The set-up here is that Natalie—apparently a very good architect—is filled with cynicism about love and romance, belittling her assistant for watching rom-coms—not because it’s at work, but because she is disdainful of such stories—and being oblivious of every admiring glance, compliment, or invitation that comes her way. The basic concept is introduced realistically by having Natalie’s mother delivering rather constant skepticism about anything touching on the romantic, especially where Natalie is concerned because she is heavy-set. (“Give up those dreams, girl; that will never happen to you!”) The story also brings home the resulting lack of self-worth that Natalie has developed, as in “Sure, I’ll take your trash and dispose of it”, “Sure, I’ll call the printer repairman”, etc. What transpires in an expected way is that Natalie has experiences that finally bring home to her—that is, she gets—what she has been missing; that despite the feedback from all her friends, not only does she miss the denigrations, she misses the positives coming her way. The journey it takes to get to insight for Natalie involves encounters with doctors, a suave charmer (Hemsworth) at the office, and her best-friend office mate (Devine). 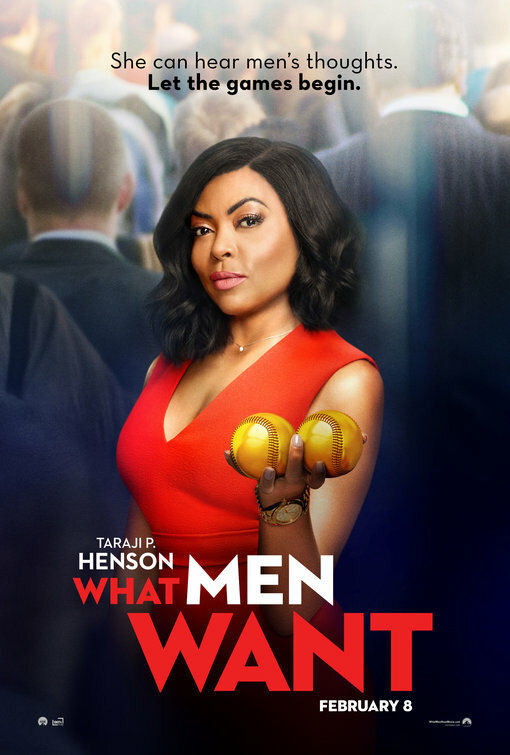 The film ends up modeling basically good principles that highlight the value of substantive human connections, but it essentially repeats what its predecessors have already portrayed. So I have to ask about the reason for the film. Is it meant to titillate viewers with the high life (private planes, yachts, extravagant parties), and then expect to pull them in with heartfelt values? 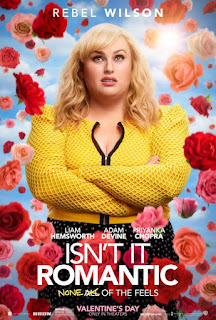 Rebel Wilson is a gifted actress who, like McCarthy in her movies, is using slapstick to make light of being heavy, which overshadows their acting ability. How I wish both of them would find/pick scripts that portray them as normal people with interesting problems that ignore their physical appearance. It seems to me that the Europeans are much better than Americans at casting actresses based on their ability to portray all kinds of characters irrespective of their physical appearance. 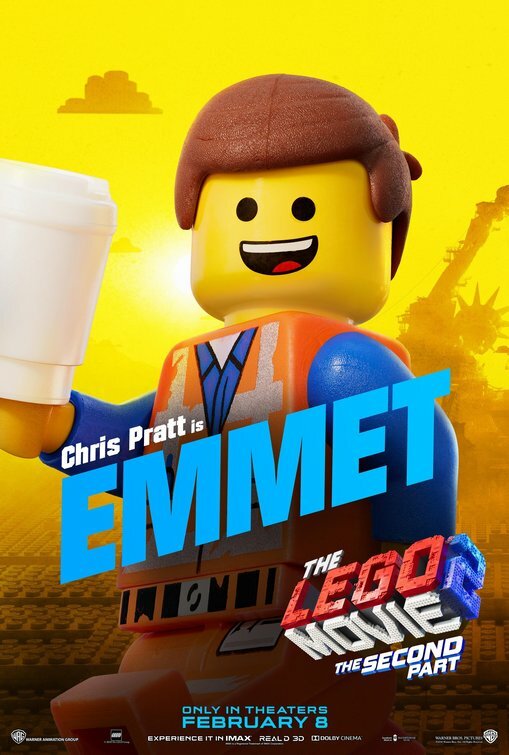 This movie runs the risk of promoting a stereotype when it’s trying to do just the opposite. It’s the acting that will save this film—if anything will—not the hackneyed story. Rom-com about a heavy-set woman having dreams that are fulfilled—just not in the way she expects.